Miami | Habari Gani, America! 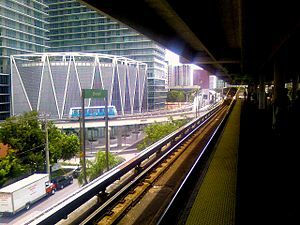 MIAMI (WSVN) — A South Florida woman claims a security guard forced her to exit the Metrorail last month for refusing to stop singing religious hymns. The incident involving 82-year-old Emma Anderson and the guard occurred Feb. 20 at the Brickell Metrorail station, was caught on cell phone video. The footage shows the guard approaching Anderson, who was singing loudly on a corner seat and tapping her thigh with a rolled-up piece of paper to keep time with the music. via WSVN-TV – Elderly woman forced off Metrorail for singing hymns. Speaking about improving the voting experience for citizens, President Barack Obama tells the story of Desiline Victor, a 102-year-old Floridian, who waited more than six hours to vote.